For the last two weeks, Mrs Anderson's reading group has been focusing on a specific chapter of our choice to do a series of challenges on based on the topic of our stories. These activities could've been done either alone, or with a partner (As long as we both had our own copies of the same book, or we set up a time to read it together. I chose to do this challenge alone, as I prefer to do activities like this one by myself. Although it was fun to see what partners had created together. For this activity, I drew a comic that shows a scenario including the main idea and theme of the story. After reading my story, I found that the main idea of my story was to never give up, no matter the cause as there is always a way around things. What I had come up with as a comic idea was that my main character (Harry Riddles) was in a test, and he didn't know how to figure out a specific question. He thinks long and hard, until he finally figures it out. 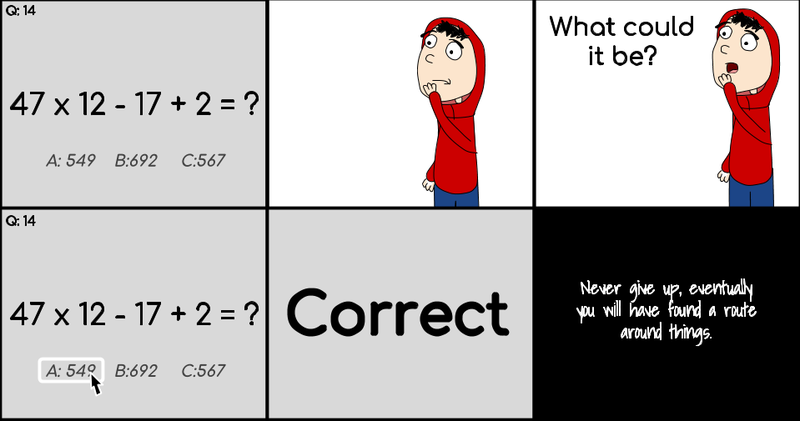 This relates to my theme because if Harry gave up at that moment, then he would have never found the answer. I had a lot of fun doing this activity, writing and drawing. I hope that you too enjoy the outcome.